Author: Dr. Robert R. Blake, Dr. Jane Srygley Mouton. At conception, the managerial grid model was composed of five different leadership styles. These styles were a relation between a manager's concern for people, concern for production and his motivation. The motivation dimension really provides the underlying motive of the leader behind a successful leadership style. Thus the managerial grid model categorizes leaders into one of 81 possible categories. Later, two additional leadership styles were added as well as the element of resilience. These leaders have minimal concern for people and production. Their priority is to fly under the radar while they content to seek solutions that won't bring any negative focus to themselves or their department. Preserving their employment, position as well as their seniority is what drives their elusive and evading behaviors. In short, the indifferent leaders are ineffective and are sorely lacking in any of the traits that can be attributed to successful and effective leaders. These leaders will go above and beyond to ensure that the needs and desires of his employees are met. These leaders are making the assumption that their staff will yield maximum results as they are likely to be self-motivated when they are lead in such environment. These leaders will have behaviours that will yield and comply with the needs of their staff. The productivity of the group however, can suffer from the lack of attention on tasks. These leaders balance out the needs of their staff with those of the organization, while not adequately achieving either. These leaders will balance and compromise their decisions, often endorsing the most popular one. They dedicate minimal efforts towards facilitating the achievements of their staff or the production results in average or below average levels. These leaders focus all of their attention to production-related matters and very little towards the needs of their employees. These leaders will direct and dominate while holding the belief that efficiency gains can only be achieved through rigid disciplines especially those that don't require human interaction. Employees are considered expendable resources. Productivity is usually short lived as high employee attrition is unavoidable. The dictatorial style is inspired by the McGregor X theory. According to Dr. Robert R. Blake and Dr. Jane Srygley Mouton (and I agree), the sound leader is the most effective leadership style. These leaders will contribute and are committed, can motivate and are motivated while holding the belief that trust, respect, commitment and employee empowerment are essential for fostering a team environment where team members are motivated, thus resulting in maximum employee satisfaction as well as the most efficient productivity. This sound leadership style is also inspired by the McGregor Y theory. These leaders, as the name suggests will seek any situation that will be of benefit to themselves. They will adopt any style that will increase the likelihood of reaching their objective. They will exploit and manipulate in order to persuade others. Any means is acceptable for securing personal benefits; gaining support is only a secondary concern. These leaders are a prime example of "The end justifies the means." These leaders will guide their employees and define initiatives for others and themselves. They will praise and reward employees for good performance. They will, however, discourage any thinking that is contrary to their own. Initiative Being at the forefront of action. Inquiry Seeking and testing information's to further one's own understanding. Advocacy Communicating your opinions and ideas with convictions. Decision Making	Identifying possible options and consequences and acting on one. Conflict Resolution	Confronting disagreements and reaching a resolution. Critique Using previous experience to anticipate how behaviors have an effect on actions. Resilience Understanding how problems influence the ability to move forward. 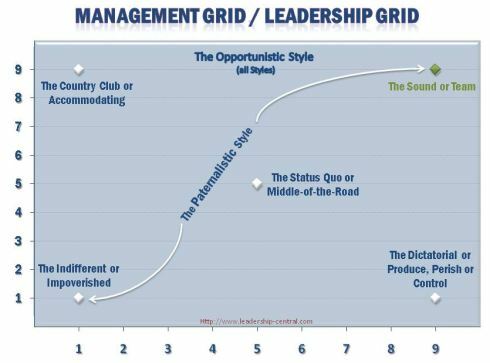 according to leadership grid, country club management is denoted by what characteristics?